Originally living in Livermore John and Lisa Gash got the wine bug. Since both worked at Lawrence Livermore Labs, they were familiar with the Livermore Valley wine scene, but they ultimately choose vineyards in Lodi to source their grapes. As self-taught winemakers, their first vintage was in 2005. 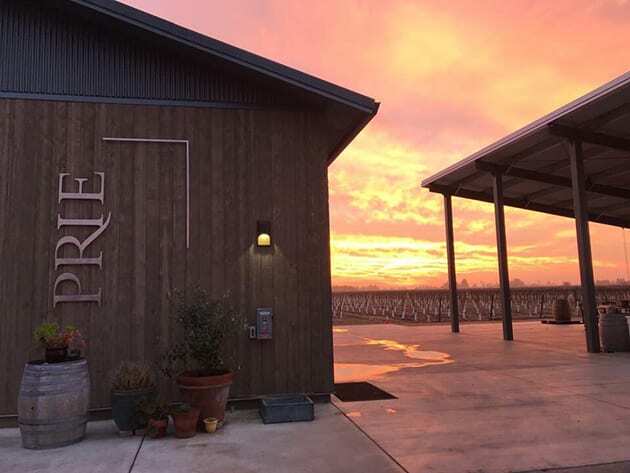 As their passion for winemaking grew their tastes in wine became more eclectic, yet the backbone of Prie Winery Vineyards is the expression of the grapes. 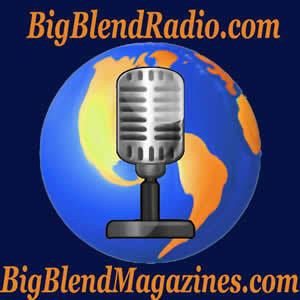 It all began as a hobby for Lisa, but when friends and family started giving accolades, John grew interested. With both being self-taught today, John handles the technical side of the process while Lisa maintains the creative and artistic side. By 2010 they went commercial and rented space in Livermore to produce their wine. By 2011 John and Lisa purchased some of their grapes from the Soucie vineyard, a well-known Lodi vineyard on the western edge of the Mokelumne River AVA, originally planted in 1916. In 2012 they purchased the Cliff Mettler house and vineyard. They constructed their Lodi winery in 2013, and the tasting room opened in 2015. In their vineyard, they grow Cab Franc, Picpoul Blanc, Grenache, Mourvèdre, and Cabernet Sauvignon. Starting this spring, they are planting Prieto Picudo and Mencia. I would characterize the wines as old world in style yet each wine variety carries its own particular demeanor. Focusing on single varietals, one finds a surprise with each varietal. The wine is vintage driven and not the same every year. Thus, there is diversity within the varietal. I found primarily in the reds a soft, subtle elegance, consistent within each variety. 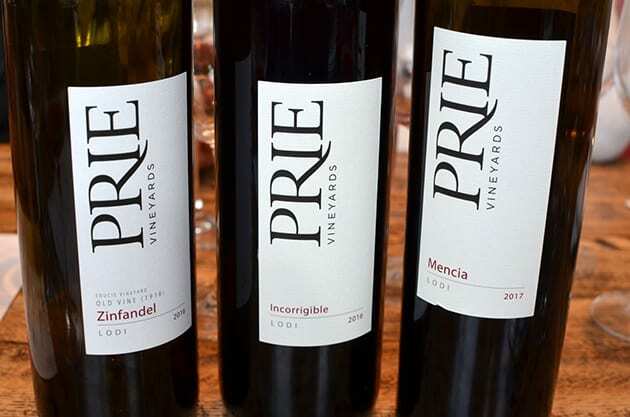 As a small boutique winery; Prie makes 18 different wines and some grape varieties more unusual like Picpoul Blanc, Dornfelder and Mancia. Another example is the Grenache Clair where they treat the grapes as if they were red wine but press instead of leaving them on the skins. The Gash’s seemingly think outside of the box. This aspect is evident as they are the first in California to produce Mancia. Prie in old middle English means the number 3 and, in this case, it stands for three generations but not in the typical sense of winemaking where the legacy of the winery passes down from generation to next. 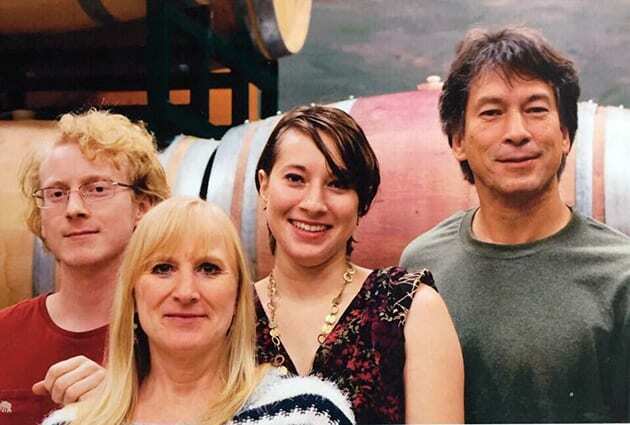 The winery is a family affair with three generations working together; John and Lisa although the owners are the middle with Lisa’s father Gordy at the top. He works in the winery but will not accept money. Payment comes in the form of cookies. On the days Gordy works you can always count on munching on cookies while visiting. The Gash’s son and daughter also work at the winery, so they represent the future. Prie Winery Owners/ Winemakers, John and Lisa Gash with Forest and Paige. Photo Courtesy of Prie Winery. 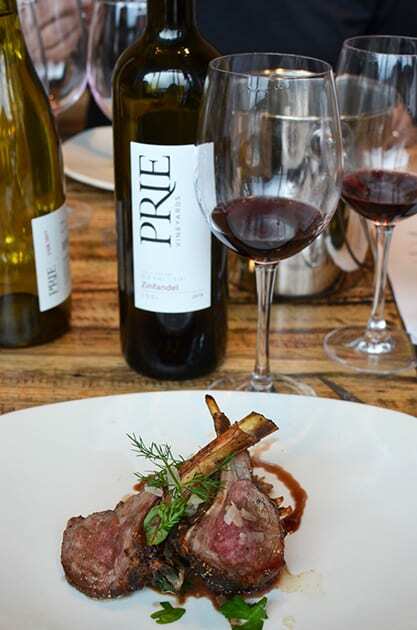 Recently LA Wine Writers featured Prie Winery at their monthly luncheon at Napa Valley Grille. As always, Chef Kenny Spost excellently paired the wines to a spectacular four-course meal. Most people do not think much of a first course of Salad, but if you never tasted the creative salads that Chef Kenny Spost composes, they are unique, but pair unbelievably with the wine served. 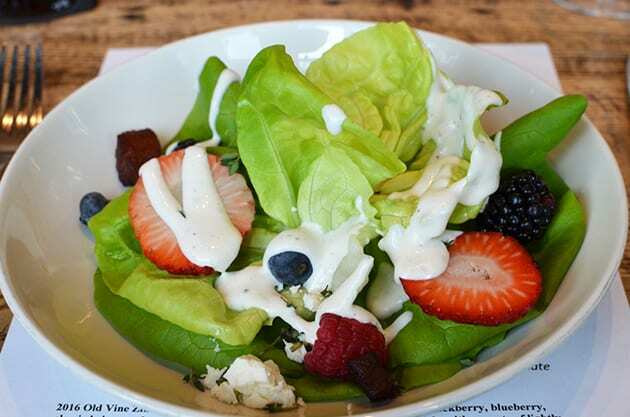 In this case, it was a B & B Salad of Butter lettuce, fresh berries, Nueske bacon, and Buttermilk Dressing. 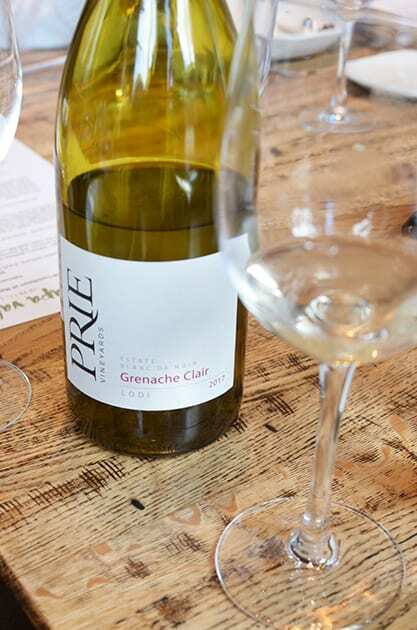 Prie Winery 2017 Grenache Clair: In French, Clair means clear and the idea behind this wine is to take Grenache Noir, a red grape and make a white wine. The grapes are destemmed and treated like a red grape for red wine except the grapes are pressed immediately. Aged in stainless steel the wine is smooth but its texture bears the likeness of a red wine. On the palate, I found lemon and pear. 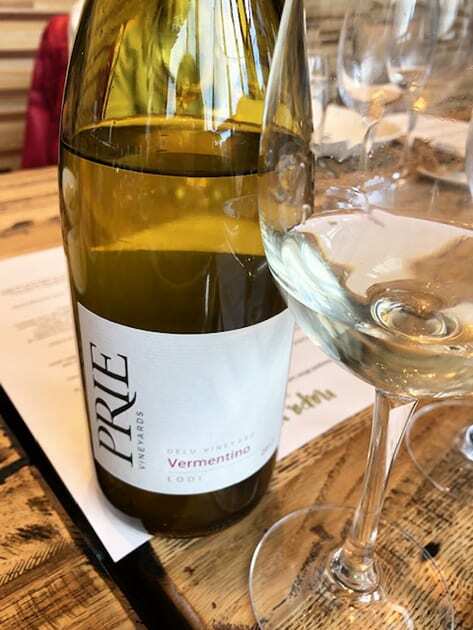 Prie Winery 2017 Vermentino: On the nose, you can smell the acidity along with the florals. The wine displayed a bright acidity that gives way to a citrusy especially lemon flavors accented by dried herbs. This wine was paired nicely with Linguini Vongole – littleneck clams, white wine, red chili flakes, and chopped parsley. 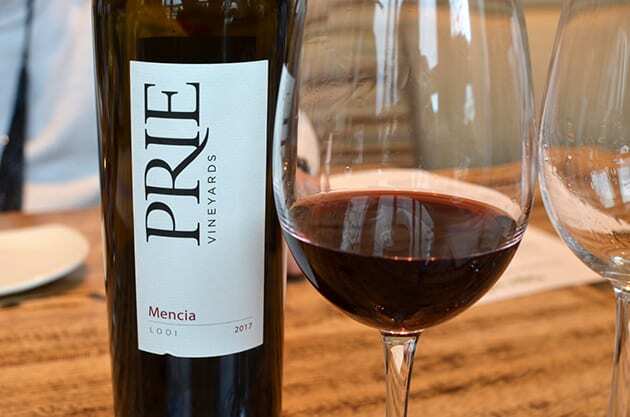 Prie Winery 2017 Mencia: The piece de resistance of the luncheon Mencia. This wine can carry itself with or without food. As my favorite wine of our tasting, the wine delivered a rustic quality and presented itself as an old-world style. The wine is tart yet fragrant with its notes of cherry and black tea. Prie Winery 2016 Incorrigible: A blend of Cabernet Franc and Zinfandel, the balance on this is superb. The wine exhibits the white pepper spices of Zinfandel and the subtle veggie qualities of Cab Franc. The wine is very fragrant. This wine was paired with Braised Port Tacos – Ginger cilantro sauce, Queso Fresco, and pickled red onion. Prie Winery 2016 Old Vine Zinfandel. This Zinfandel presents itself as a medium bodied wine. The two words that come to mind in describing this wine are alive and wow. I found an elegant wine that is very smooth and balanced. Subtle hints of white pepper prevails against the blackberry and blueberry flavors. This wine was paired with Lamb Two Ways – Braised shoulder, baby kale, lamb rack, mint-pomegranate reduction, and San Andreas goat cheese. I walked away from this luncheon sensing the feminine had that Lisa adds to the wine. 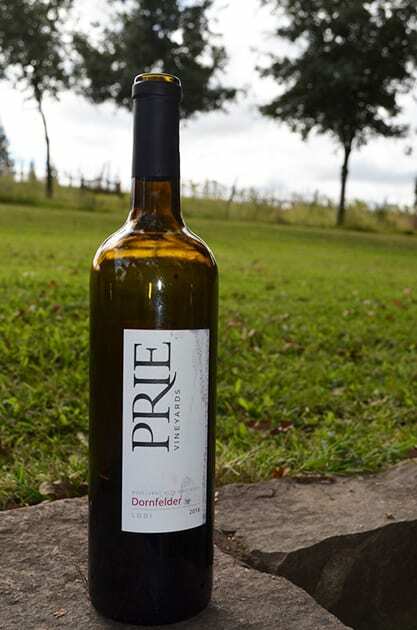 It represents the elegant qualities ever present in Prie’s wines. I am thus making them a favorite Lodi Winery.